X-rays are a very useful way of diagnosing all kinds of conditions. They can be used to look at bones for signs of fracture or infection. They’re also used to look more closely at joints for indications of damage or inflammation and they can also be useful for identifying signs of disease in organs and soft tissue. 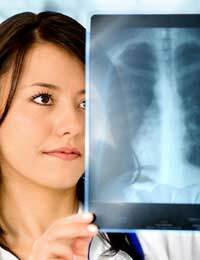 X-rays are sometimes referred to as ‘radiographs’ and the person who conducts the X-ray is known as a radiographer. They work by exposing the relevant part of your body to a very small dose of ionising radiation. When the X-rays come out of the other side of your body and hit the photographic film, they create a pattern of light and shade which enables the person who’s responsible for treating you to see clearly what the problems might be within your body. Sometimes X-rays are carried out before or after surgery but, in some instances, you may just need to attend as an out-patient. The procedure itself lasts little longer than 5 or 10 minutes depending on how many X-rays need to be taken and depending on the part of the body which is being X-rayed, you might be asked to undress and to put on a hospital gown instead for the duration of the procedure. It will usually involve you either laying down on a table or sitting in a chair and once you’re in position the part of your body which is being X-rayed is resting against the photographic plate of the X-ray machine, the radiographer will then go behind a separate screen to capture the image. In spite of them being positioned behind a screen you will be able to see and hear each other at all times which is important as the radiographer might need to ask you to put yourself into a different position so that they can take several X-rays from different angles. The whole procedure is entirely painless. You’ll normally be asked to get dressed (if you've needed to undress) and wait in the waiting area outside the X-ray room until the radiographer has either produced the image(s) which they’ll put into an envelope and ask you to either take them on to the relevant department, if you are to undergo further treatment or you might simply be allowed to go home where you’ll wait to hear the results and what happens next from either your GP or the hospital. This will usually take between a few days to, perhaps, a week or so. As there’s no pain and no need for any anaesthetic for an X-ray, you can continue as normal if you’re going home and there’s no problem with driving. Although you are exposed to some degree of radiation, this is not harmful and would represent a similar level of radiation to which you might be exposed over a period of a few days to several months within your natural environment. However, if you’re pregnant, you need to tell your doctor as X-rays can harm a foetus and are never performed on a pregnant woman unless it is an absolute necessity.